1980: Doctor Who - Revisitng FULL CIRCLE | Warped Factor - Words in the Key of Geek. Tony Fyler goes through an Emboitment. Full Circle caused much grumpiness in certain quarters of the fandom when it first hit screens in 1980, because a) it was written by a fan, and b) it was written by a fan that wasn’t any of the ones doing the complaining. Andrew Smith was just 18 when his idea for the story that would launch the Fourth Doctor, the Second Romana and the Second K9 into an entirely different universe for three very different, and in most cases scientifically exploratory stories was picked up. On rewatching, it remains the best of the three. While State of Decay is a fairly standard vampire story with a nice technology-becomes-mysticism angle that we’d seen done before, and Warrior’s Gate pushed the envelope of the science pretty much beyond the point at which it was possible to care for the characters, Full Circle got the balance right – it’s the Baby Bear of the three E-Space stories, and a much easier, more enjoyable watch than the other two. You don’t get to have your Doctor Who story immortalized on screen just by being 18 and a big fan. Andrew Smith was a really good writer even back then. There’s absolutely no fanfare in Full Circle that says ‘Ooh, look – E-Space’ – the whole thing is treated as a monumental pain, but like one of those things that is bound to happen sooner or later, like being led down a narrow farm track by your GPS. After a bit of a rippling effect, the Tardis travelers find themselves on ‘Gallifrey’ – which isn’t Gallifrey. That’s the point – the whole E-Space thing is presented as a series of problems to overcome, rather than a big new storytelling direction. The society of the Starliner is effectively delivered – mostly happy drones, replacing and repairing the ship for embarkation ‘back’ to Terradon, three Deciders to give the society its laws, with only the First Decider allowed to see the Starliner’s system files (which it’s pretty much explained early on contain terrible secret knowledge). The Outlers have that sense of middle-class teen outrage that was especially popular in the early 80s – they feel a fairly feckless bunch and probably wouldn’t be able to point at an actual grievance if challenged, beyond boredom and the fact that they’re not in charge and no-one takes them seriously. Lots of foot-stamping and teddy-bear throwing before bedtime, we predict. But before anyone can get sent to their rooms without any supper, there’s Mistfall. To give Smith his credit, there’s a logical in-story explanation given for what Mistfall is – Alzarius, the planet of mists and river fruitfulness, gets pulled out of its place in space ever fifty years or so, causing a cooling, and the mist…erm…falls. Cue weird insect life, highly adaptive Marshmen and a retreat into the Starliner to use it as a bunker till the mist clears and the endless life of preparation for Embarkation can continue. The underlying story of the Starliner’s people not being at all who they think they are, and the whole thing being an Alzarian story – the basis of the ‘full circle’ referred to in the title - is revealed in effective degrees, and surprisingly, even at 35 years’ remove, doesn’t feel especially over-padded. While it’s difficult to generate much sympathy for many of the characters – the Deciders who cling onto power through the expedient of endless activity without progress, the Outlers with their spoiled comfortable teen lives, who end up for the most part being a liability to the community, Dexeter the scientist, who despite having the best intentions, checks his conscience at the door and would perform televised dissections of a Marsh Child’s brain – really speaking, there are not many in the way of likeable characters in Full Circle. But what there are are certainly interesting characters. 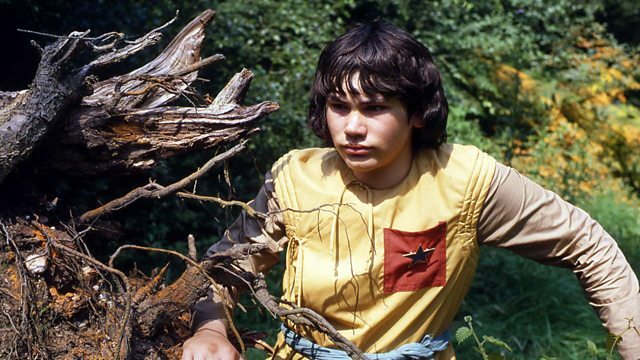 Varsh and Adric may not be your ideal companions for a long river fruit stealing trip, but you do invest in them, do wonder about their youth, Adric with his Elite status and his badge for mathematical excellence, Varsh with his need to look out for his prodigious but headstrong idiot brother – to be fair, it’s one of the few times in the character’s life when you feel Adric might actually be a worthwhile reason for skin to have collected together in one place. 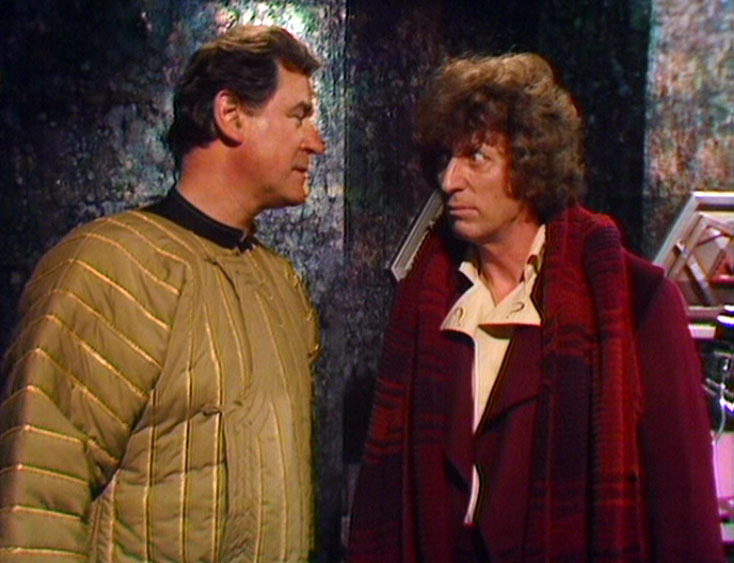 Andrew Smith, given the chance to introduce a young male would-be companion and Matthew Waterhouse in his first story going all out to prove himself, we suspect, to Tom Baker, actually manage what seemed impossible for much of the rest of the character’s time on our television screens, creating a character you don’t want to throat-punch most of the time. And then there’s George Baker. Imagine, if you can, the non-geek world. They still know George Baker over there, for his tight, exhausted, raging Tiberius in I, Claudius, or his avuncular but take-no-nonsense Inspector Wexford in a long-running detective series, and from countless other things besides. George Baker never knowingly gave less than his absolute best, and here he helps light up Full Circle with his Decider Login, a man popular by virtue of his honesty of character, who cannot stand by while the other Deciders decide nothing and go nowhere. He’s instrumental too in bringing the heart of Full Circle front and centre – while technically it should be young teens Varsh and Adric who pull on our Whovian heartstrings, actually it’s Baker’s Login with his conflict between what he knows is right for the wider community and his aching love for his Outler daughter. Baker treats the character and the world with respect, and gives us both a solid character in a world where everything’s in flux, and a connection to that character’s emotional and principled dilemmas. It would probably be a mistake to pretend Tom Baker’s on top form here, but he still brings the Fourth Doctor’s whimsicality and power to bear – using K9’s severed head as a face-mask to cow the Marshmen, roaring that the prevarication of the Deciders is not good enough, and stabbing straight at the heart of their cosy society by telling them the Starliner could take off in half an hour. 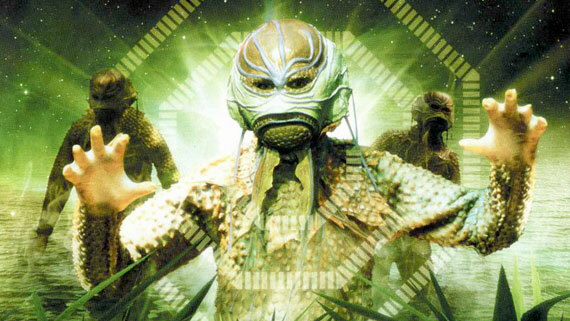 If there’s one area where Full Circle is a let down, it’s in the creature realisation. The Marshmen’s first entrance is gloriously Sea Devilish, and the mist helps make it effective, but when they’re shot too close up or overlit, as they are in the Starliner, the Marshmen look awfully like men in unfortunately creased rubber suits (though to be fair, the heads are pretty much always good). But worse than them, the spiders that provide the third conclusive clue about the nature of Alzarius’ ecosystem are dreadful, making a viewer in 2015 imagine what could be made of Full Circle with a relatively inexpensive special effects tweak today – make the spiders look and behave like real spiders, maybe adjust the light balance in some Marshmen shots, and you’d have a much easier time of suspending your disbelief and immersing yourself in the story. The point though is that the story is still absolutely sound and gripping. It blends the higher science quotient of Season 18 with how that science affects planets, ecosystems, communities and individuals, and it ends on a high note, with the Deciders, no doubt swayed by Login, finally making a decision, and taking off for somewhere that isn’t Terradon, while leaving Alzarius to the Marshmen. 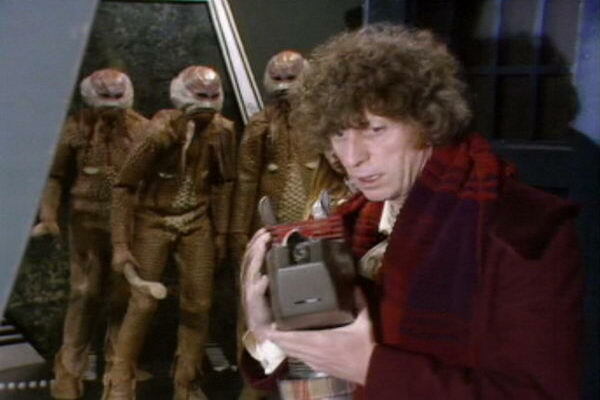 It’s only right at the end that enough breath is taken to actually deliver any detail about E-Space, and the Charged Vacuum Emboitment (CVE) through which the Tardis crew travelled. And while there are many things that can be deeply, legitimately loathed about the Christopher H Bidmead era, it has to be admitted that while to this day no-one who watched the E-Space trilogy knows what a CVE is beyond its ‘magic door’ status, actually using the phrase ‘Charged Vacuum Emboitment’ made you feel terribly, smugly clever in school the Monday after Full Circle finished. 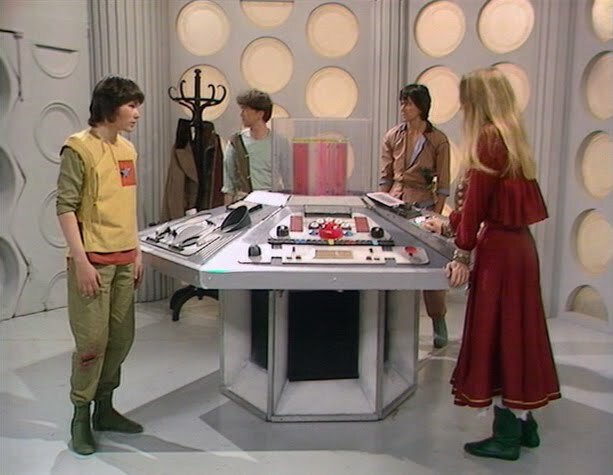 One final thing people think happens in Full Circle, but doesn’t – there’s no scene at the end where Adric joins the crew – it’s simply not there. He just turns up in the next story, State of Decay, having stowed away. On re-viewing 35 years on, Full Circle remains the Baby Bear of the E-Space stories – the things that strike you when you watch it are how dodgy some of the effects are, but how the story is still interesting and holds together from end to end. You notice Tom Baker, you notice wanting to punch Adric less than usual, and while Alan Rowe and James Bree do excellent work as Deciders Garif and Nefred, you notice George Baker as Login most of all. 35 years is not quite full circle – come back in another 15 and we’ll see how it fares. But three and a half decades on, Full Circle’s still worth slipping into your DVD player as one of the high-points of Season 18. Read our interview with Full Circle and Big Finish audio writer Andrew Smith here.